A supporter holds a placard as U.S. President Donald Trump speaks during a rally at El Paso County Coliseum in El Paso, Texas, Feb. 11, 2019. 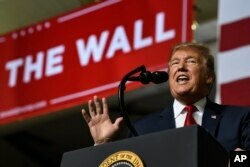 With another possible government shutdown looming, and illegal immigration still at the heart of the budget dispute, Trump is pulling out the stops to portray his proposed wall as essential to public safety, including stemming crime. As he's done repeatedly, Trump also defied the record in claiming that the wall that Congress has refused to pay for is rapidly coming together anyway. TRUMP, on the effect of a border wall on crime: "When that wall went up, it's a whole different ball game. ... I don't care whether a mayor is a Republican or a Democrat. They're full of crap when they say it hasn't made a big difference. I heard the same thing from the fake news. They said, 'Oh crime, it actually stayed the same.' It didn't stay the same. It went way down. ... Thanks to a powerful border wall in El Paso, Texas, it's one of America's safest cities now." THE FACTS: There's less going on here than his words convey. Construction is getting started on merely 14 miles (23 kilometers) of extended barrier, approved by Congress about a year ago in an appropriation that also authorized money to renovate and strengthen some existing fencing. The extension will be in Texas' Rio Grande Valley. That's not a "big, big portion" of the grand project he promised in his campaign and countless times since — a wall that, combined with existing fencing and natural barriers, would seal the nearly 2,000-mile (3,200-kilometer) border with Mexico. TRUMP: "We're going to El Paso. ... We're going there to keep our country safe, and we don't want murderers and drug dealers and gang members, MS-13, and some of the worst people in the world coming into our country. ... We need a wall." The authors acknowledged that it's possible that people who came illegally are less likely to report a crime. But the authors also note that such immigrants overwhelmingly arrived to work, a trend that helps reduce crime levels. Find more AP Fact Checks.